Indo-Chinese food has come a long way… everyone has a different take on it. It is common now for Indians to use a bit of soy sauce or chili sauce in their contemporary cooking. Most Indian households will have a basket of Chinese sauces and pastes used commonly in “Chinese” fried rice, Manchurians and Schezwan. 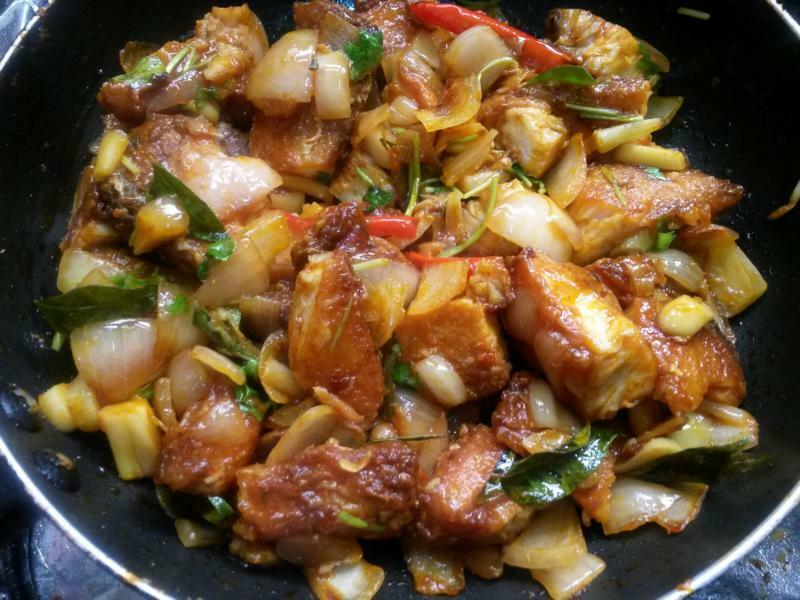 I posted Chicken Chili when I first started blogging… an Indian dish with an Indo-Chinese name…. I know, it is confusing… doesn’t matter… as long as the end result is tasty! This Fish Chili is slightly similar to the Chicken Chili. 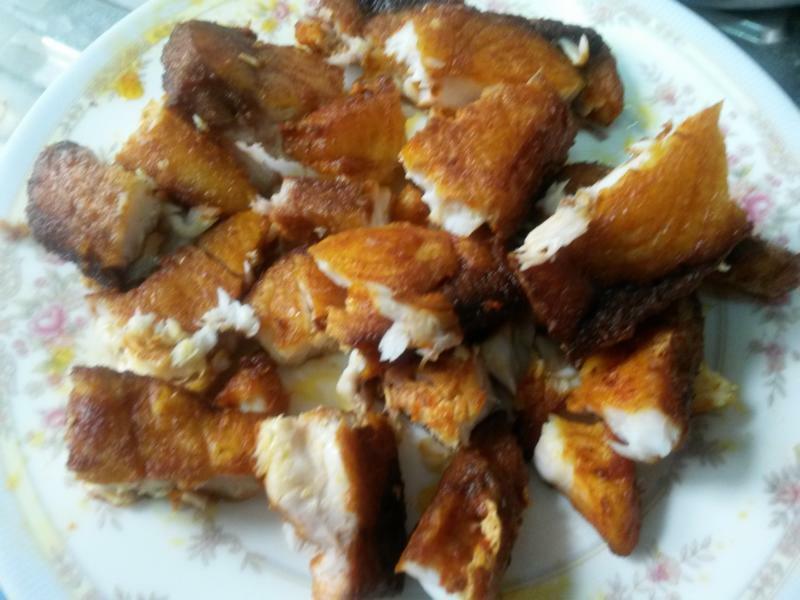 It was born one day when I had some marinated fish in the refrigerator to fry and some plain white rice. But the combination would have been too dry, so I thought of adding some masala and spicing it up! 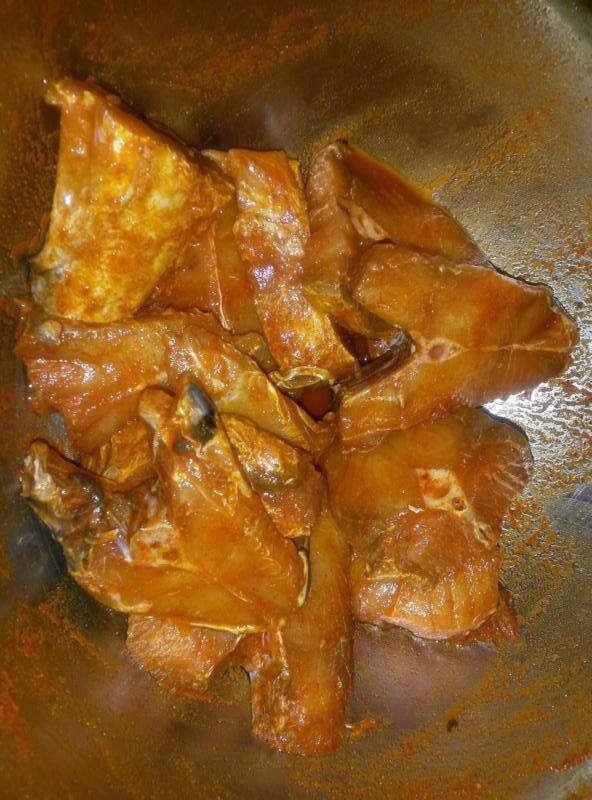 It is a great way to eat fish, especially if you want to avoid the bones. It goes well with rice, breads and rotis and can even be served as a spicy appetizer. Most south-east Asians prefer bony fish. They have strong fishy taste and especially good in spicy preparations. Black pomfret is a good choice for Indian fish recipes. Cut the pieces in medium size and marinate with salt, red chili powder and turmeric powder. Shallow fry till it turns light brown and keep aside. Once the fish has cooled down, remove the centre bone and keep the fish pieces aside. I believe coconut oil and fish is an excellent combination. So whether fish curry or fish fry, I almost always use coconut oil. 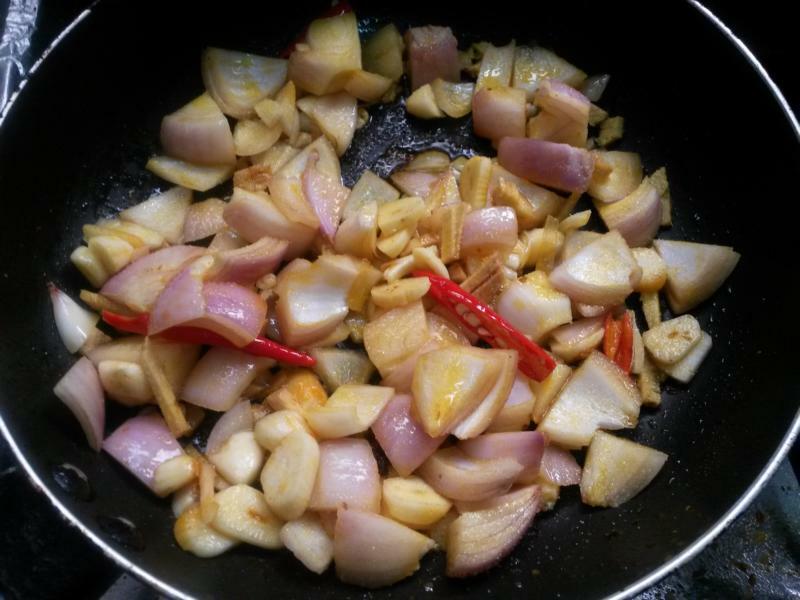 Heat coconut oil in a pan and fry onions, garlic, ginger, chilli and curry leaves till it turns light brown. Then add coriander powder, tomato sauce followed by the fried fish and mix well. Take care that the fish pieces don’t break too much. Chunky pieces are so much more satisfying. 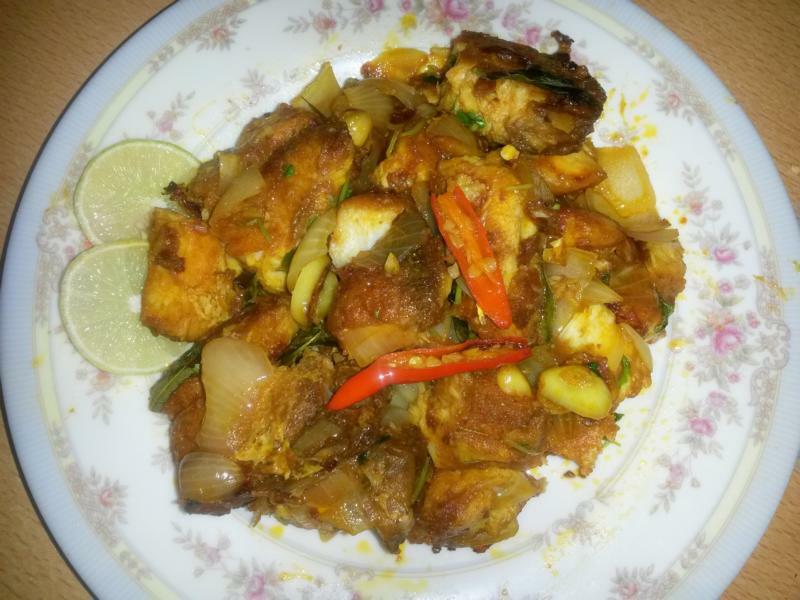 Marinate fish with chilli powder, turmeric powder and salt and set aside for maximum 3-4 hours or minimum one hour. 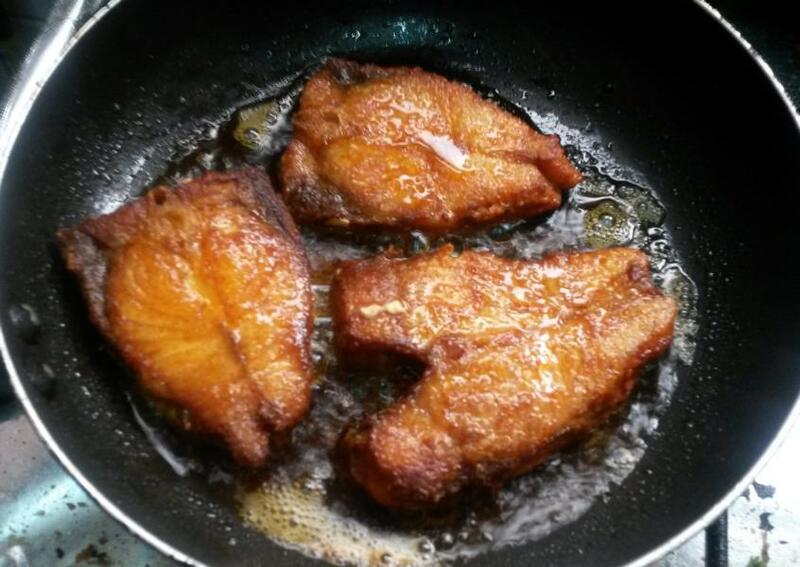 Shallow fry in 3-4 tblsps oil in a non-stick pan, on medium flame till it turns light brown and keep aside. Once the fish has cooled down, remove the center bone and keep the fish pieces aside. In another pan, pour some oil and add onions, garlic, ginger, red chilli and curry leaves and fry till it turns light brown. Then add coriander powder, tomato sauce and add the fried fish and mix well. Sprinkle the garam masala powder and mix gently again. Garnish with coriander leaves and serve hot with chapati or rice.